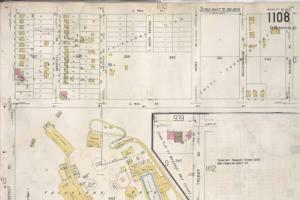 Mrs. Huddleston’s husband also worked for Mr. Prescott, as a finisher in the factory at 904-906 E. 12th Street. During the Mexican Revolution of 1910, thousands of Mexicans left their homeland in pursuit of a better life in the United States. 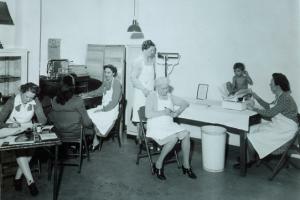 Many who traveled north to Kansas City found work in packing houses and factories and settled in the Westside neighborhood. James Butler Hickok, better known as “Wild Bill,” was a well-known scout, gunslinger, gambler, lawman, and umpire. 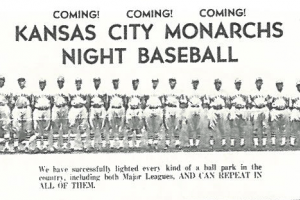 There are at least two accounts of times when Hickok was prevailed upon to umpire baseball games—once in Fort Hays, Kansas, and the other here in Kansas City. Hickok was quite a fan of baseball, which was just establishing itself as the national pastime. 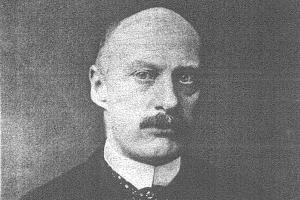 T.M. James & Sons was a store in early Kansas City that sold fine china. It was established by Thomas Martin James, who moved here from Kentucky in 1854, about four years after the founding of the Town of Kansas, or Kansas City, as we now call it. His store became the place in Kansas City at which you could buy both Wedgewood and Spode china. 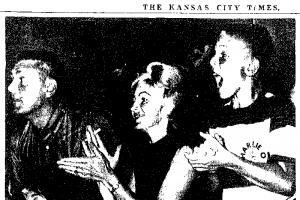 On September 8, 1965, the Kansas City Times started its 98th year of publication. The biggest story that morning was how Hurricane Betsy was pounding Florida. The storm was over 600 miles across, had hit Miami Beach with 81 m.p.h. winds, and crashed 20 foot waves near Fort Lauderdale, wreaking damage to roads, homes, and businesses. Fires, a hazard of the industrial revolution, often caused uninsured property owners to suffer great financial loss. To protect against such calamity, fire insurance companies sprang up all over the U.S. Policy writers, however, could not always inspect properties in person. In 1866, D. A. Sanborn, an enterprising surveyor in Massachusetts, began creating specialized maps to help under-writers evaluate the risks. 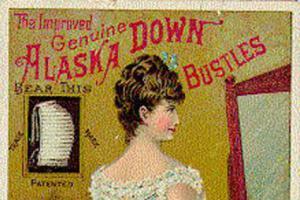 Did you know that the Missouri Valley Special Collections has over 2,000 19th century advertising cards? Many of these advertising cards, or trade cards, are from Kansas City businesses and constitute one of the more picturesque collections in the Missouri Valley Room. This collection provides not only a rich resource for researching the history of printing, advertising, medicine, fashions, late 19th century culture, etc., but also research on Kansas City companies. There was a time when you could only watch baseball in sunlight. I grew up in Idaho during the 1950s and 60s. I’m sure I’m not the only person who remembers playing pickup midsummer baseball games that started late afternoon and continued through sunset. By dusk, the game finally reached the point when the movement of the ball had become more of an inference than something actually seen, while parental shouts echoed throughout the darkening grey for the better part of half an hour, threatening unnamed consequences if we didn’t get ourselves home for supper this very instant. 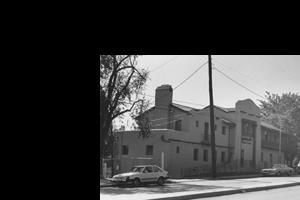 Presbyterian church, kindergarten, free health clinic, recreation center – the Italian Mission in Old Northeast was many things. As a recent donation of artifacts to the Missouri Valley Special Collections shows, the Mission was a Kansas City cultural hub for the better part of a century. 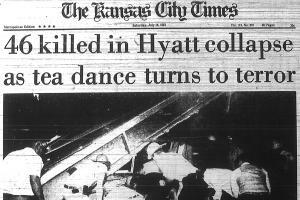 At 7:05 p.m. on July 17, 1981, two walkways inside the Hyatt Regency hotel at Crown Center collapsed during a massive party. By the time the wreckage had been cleared, 114 were dead and 216 were injured. This Sunday, July 17, 2011, marks the 30th anniversary of the disaster, and a special event at the Kansas City Public Library will explore its causes and aftereffects. 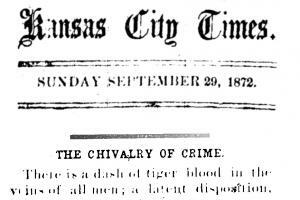 On the morning of Saturday, July 18, the Kansas City Times ran a report of the catastrophe, along with first-hand accounts and photos. Monday-Friday: 9 a.m. - 5 p.m.
*Sunday: 1 p.m. - 5 p.m. The Library shares the stories of several remarkable women in Coloring Kansas City: Women Who Made History, a coloring book produced by the Missouri Valley Special Collections.